Serious issues remain undetected for extended periods of time in the attic and crawl spaces, which can damage your home. In most cases, the havoc may not be apparent until the problems surface. Regular inspections are therefore imperative to keep your attic and crawl space in top notch state. Early detection can save a homeowner from future damage repairs. Call Quartz Solutions pronto for a free inspection of your residential space. Since there is no “one size fits all” formula for improvement of your attic and crawl space, we offer customized cleaning solutions that are just right to effectively control the perils in your home. Our advanced methods are based on specific layout because we understand that every house is unique. The hidden dangers that lurk in your attic and crawl space have the potential of compromising the strength and safety of the structure. The damage can render the property un-liveable until expensive repairs are conducted. Hence it’s vital that the issues should be tackled before they become a nuisance or threat. Seepage in duct systems and defective insulation can cause energy bills to surge and risky microbes to spread through your living space. 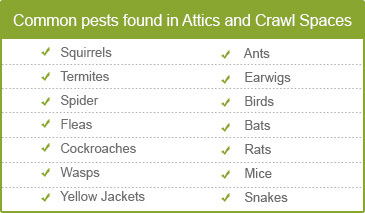 Wasps, roaches and termites bring disease, harm and ruin to your home. Animals like rats and bats have the potential to destroy structural parts, insulation and electrical connections, leaving behind an unhygienic mess. A comprehensive inspection of your attic and crawl space to correctly identify the problem will the first step towards a clean and healthy environment. Testing the area for radon gas, a known carcinogen is also a must to ensure the family’s safety. The first inspection will be carried out by trained staff, free of charge, to help determine the extent of the damage. Next will be discussions regarding possible avenues of the cleanliness process to help protect your residence. Our prices are competitive and without any hidden costs. Our expertise, which is second to none will provide cleaning choices that are tailor made, extremely safe and effective. We love Rockaway Township located in North Western Morris County that is home to over 22,000 residents. 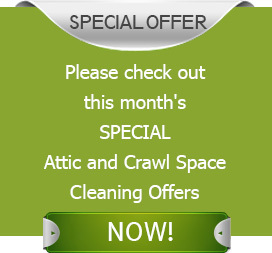 If you are facing issues in your attic and crawl spaces Quartz Solutions is the perfect answer. Our highly proficient technicians are well qualified to eliminate the problem quickly. For a free inspection in Rockaway NJ, give Quartz Solutions a call immediately at 973-536-1013.